Here's my card for the current My Favorite Things Wednesday Sketch Challenge. I created a coffee themed thank you card using the Coffee Date and Coffee Break stamp sets. I don't use purple much, so I decided to shake things up a bit and build my card on a pale purple card base. 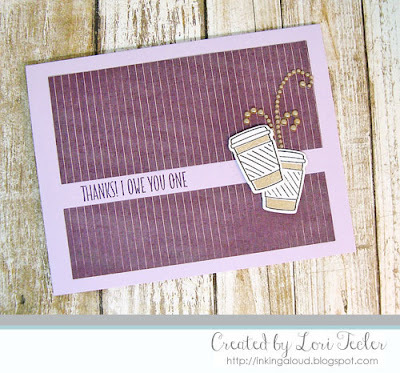 After cutting a purple striped patterned paper panel into two pieces and adhering them to the card base, I added the pair of to go cups on top, using foam tape for dimension. The thank you sentiment fit perfectly in the space between the two panels. I used a dark purple ink to coordinate with the rest of the card. The final touch was positioning a piece of taupe flourish extending out from the cups as "steam."